Common plantain is a shade-intolerant, herbaceous perennial (sometimes annual) species with fibrous roots from a compact stem. Plants may be hirsute or glabrous. It is one of four species of Plantago found in BC and is widespread in the province. It is a common species on pathways and in areas of compacted soil across North America. It is a self-compatible, wind-pollinated, allergenic species that reproduces by seeds. 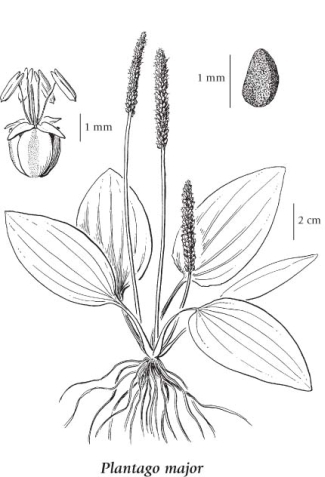 Bassett (1973), in his monograph The Plantains of Canada indicated that the origin of this species had not been established and it was not known if it was native to North America or introduced. However, since that publication, many sources list it as an introduced species native to Eurasia (e.g. USDA 2010). Bassett, I. John. 1973. The Plantains of Canada. Monograph No. 7. Research Branch, Canada Department of Agriculture, Ottawa. USDA. 2010. Plantago major. United States Department of Agriculture Plants Database. Available Onliine. Perennial herb from a fibrous root; stems erect, several, simple, smooth or stiff-hairy, 5-50 cm tall. Basal leaves broadly elliptic to lanceolate or egg-shaped, tapered into long stalk, entire or irregularly toothed, 4-18 cm long, 2.5-11 cm wide, strongly parallel-veined; stem leaves lacking. Inflorescence of dense, narrow, bracteate spikes, the spikes less than 1 cm thick, 5-30 cm long, smooth; corolla greenish, 4-lobed, the lobes deltoid, 0.4-0.5 mm long; bracts 2-4 mm long, thin-margined; stamens inconspicuous. Capsules, egg-shaped, 2.5-4 mm long; seeds 5-25, black or brown, 1 mm long, finely veined. Mesic to dry lawns, fields, roadsides and waste places in the lowland, steppe and montane zones; common in SW BC, less frequent elsewhere; introduced from Eurasia. Plantago asiatica auct. non L.
Plantago major var. asiatica auct. non (L.) Decne. Plantago major var. intermedia (DC.) Pilg. Plantago major var. pachyphylla Pilg.